Shillong Lajong FC will clash for the first time in Ludhiana when they face off Minerva Punjab FC in the Hero I-League week day encounter at the Guru Nanak Stadium at 7PM on Tuesday. 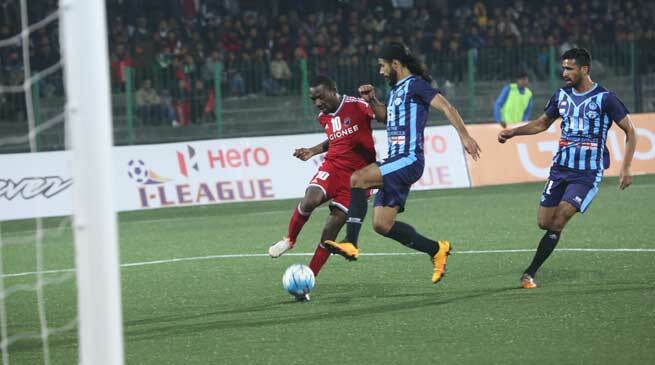 The Reds won the first leg fixture against Minerva Punjab by 2-1 with Rupert Nongrum and Aser Dipanda Dicka netting their first goals for the Club in the game. Lajong are heading into the 13th round of the I-League after a 1-2 defeat at home against East Bengal FC last Saturday. The team had a couple of real good chances on goal but were unlucky not to convert. Dicka however was the provider on the occasion scoring the consolation goal and has now taken his goal tally to 9 goals from 11 matches. Thangboi Singto has very high expectations from him and is hoping the entire team also performs collectively well and gets positive result from the game against the Punjab side. Singto said that Minerva is no longer the same team we played in January. They have improved tremendous. “Minerva is a stronger team from the one we last played. We need to defend better and take our chances. If we can fulfil that then we should be good”, Singto said. After the game on Saturday against East Bengal, Shillong Lajong departed for Ludhiana on Sunday afternoon from Guwahati and arrived late night. The team managed only one day of recovery and practice session at the main stadium venue. “We need to recover the best way we can and be fresh and ready for the game against Minerva. It will be a challenging game with only one day to recover for both teams. But we will go all out for the win”, added Singto. Meanwhile, Minerva Punjab FC is heading into Tuesday’s clash after a 1-0 defeat to Bengaluru FC at home. The I-League newcomers who are 8th in the I-League standings have won twice, drew and lost five times. They are on 11 points from 12 matches played. The Punjab side have played five matches at home won their first game at home against Mumbai FC by 2-1 on February 4. Baoringdao Bodo and Anirudh Thapa netted two fine goals to give their side the much needed win. After this, Minerva travelled to Bengaluru and displayed another commendable performance to hold the defending champions to a 1-1 draw on February 11. They won their second I-League game against Churchill Brothers in a high scoring game with Punjab winning by 5-4 on February 19 in Goa. Thangboi Singto’s men are looking to take away nothing but three points from the game and better their position in the I-League standings. The Reds slipped down to number five sharing same points with Bengaluru FC on 16 but the latter goes to fourth due to the head to head advantage.